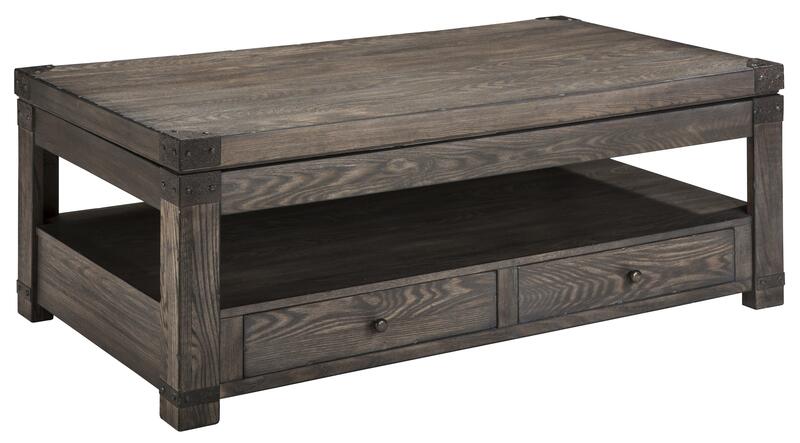 Prominent wood grain in a gray/brown finish bring a rustic look to this rectangular cocktail table with a lift top. An open shelf and two drawers provide storage to the table, while metal corner brackets add an industrial design detail. 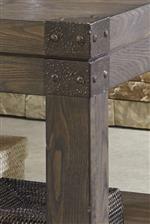 The Burladen Elm Veneer Rectangular Lift Top Cocktail Table in Grayish Brown Finish by Signature Design by Ashley at Michael's Furniture Warehouse in the San Fernando & Los Angeles area. Product availability may vary. Contact us for the most current availability on this product. 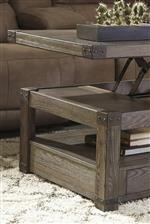 The Burladen collection is a great option if you are looking for Vintage Casual Casual furniture in the San Fernando & Los Angeles area. Browse other items in the Burladen collection from Michael's Furniture Warehouse in the San Fernando & Los Angeles area.